Osti Original replacement wires, are precision made from only the finest high quality stainless steel. The wires are produces semi-manually and every single wire is checked before packaging. When replacing the wire read at the back of the packaging or below. Grab the cheese slicer from below, with one hand. Remove the old wire. Turn down the bolt as far as possible, and let the Cheese-fork drop all the way down on top of the bolt. Insert one end of the new wire into the longest of the two holes in the disc, and keep the wire in place with your thumb. Move the wire over the top of the rod, through the slit in the rod and through the cheese-fork. It´s important that the “forks” of cheese fork is facing right. Move the wire down to the short hole in the disc, and insert the wire. Keep the wire in place with your index finger. As you are now keeping the wire in place with your thumb and your index finger, use your free hand to move up the bolt and the cheese fork as far as possible. You are now ready to slice. Always remove the rinds of the cheese with a knife before slicing. Always adjust the tension of the wire to 100 % before slicing. When slicing, do it slowly with ease and care, from top to bottom. Do not put your weight into the slicing. Let the cheese slicer do the work. Tighten the wire as you go. 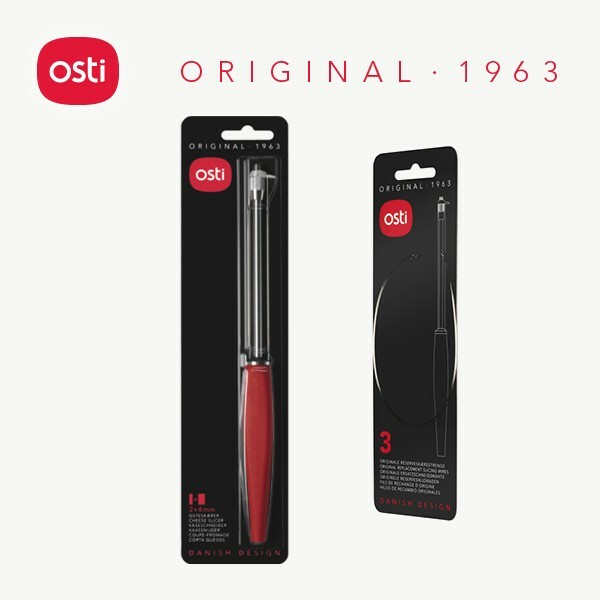 The Osti Original cheese-fork for the cheese slicers with plastic handles, is made in the hardest possible food friendly material, allowing us to shape the cheese-fork in the distinctive shape and giving it the opal look we prefer. 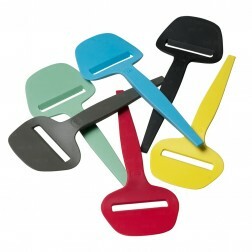 The cheese-fork is dishwasher safe along with the Osti Original cheese slicer with plastic handle. If you want the cheese-fork to last half a generation or more, we recommend that you wash the fork (and your Osti Original cheese slicer with plastic handle) by hand. Otherwise the cheese-fork will inevitably be worn down over time, due to the heat from the dishwasher, the wear and tear from chemicals in the soap and the friction from the wire. All Osti Original cheese slicers with plastic handle, the Osti 822 / Osti 832 in stainless steel / Copper and the Osti 01 cheese planers in nylon are dishwasher safe. Generally we do not recommend dishwashing of products completely or partially made of wood, as the Osti Original with handle in walnut wood and the cutting board in oak wood. Which Osti for which cheese? 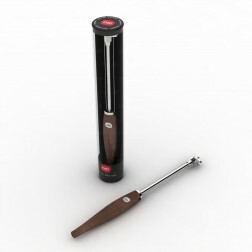 The Osti Original cheese slicers with plastic-, stainless steel and walnut wood handles are perfectly suited for the classic soft and medium hard ”yellow” cheeses. They can of course also handle the slightly harder cheese, such as Cheddar, Gouda and Emmentaler. However, we do recommend that you use our Osti non-stick cheese planer, for the hardest types of cheese. The Osti cheese planer also cuts thinner slices, which also accomodates the calorie conscious. The Osti 303 / Osti 803 rolling cheese slicers, are suitable for all of the above cheeses. Depending on the angle and the pressure, the Osti cheese slicer with roll, is able to slicer even slices from app. 1 mm up to app. 5 mm. For the softest types of cheese, like blue cheese, fresh cheese and melting cheese, we also recommend using an Osti cheese knife.